As we already know Google AdSense is one of the best publisher site for monetize blogs or website. Millions of peoples using this company for make their career and earn big cash. But now a days it too hard for getting an approval Google AdSense account, some people have luck to get it and lost the account for some reason or mistake. If you failed to approve your Google AdSense account, then I will recommend you to read this post. Great ways to approve Google AdSense account. 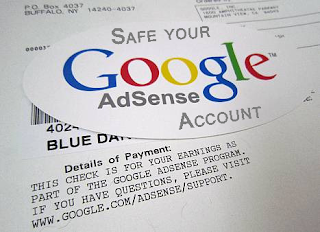 Today I created this post for give you some ways how to safe your Google AdSense accounts. In this post you can learn what you need to do after get a approve Google AdSense account. So let’s begin. After get your AdSense account you must need to follow some steps for safe your AdSense account. If you break some rules or steps. You probably see your account banned. When some people got an AdSense account for their blog. They are start spamming via blog commenting, Facebook group shares and many more. And when the AdSense account got banned they are asking what’s wrong they did? Spamming is really harmful way to get visitors and easy way to ban your AdSense account. Try to publish 1 content daily, because content is king. Google loves valuable content. Try to create content for your readers, not for Google. Make sure your content helpful and useful for your visitors. Don’t force your friends, cousins, brothers or others to visit your blog and click the AdSense ads. Because they easily catch fake clicks with eyes. :D So you must need to avoid this if you want to keep your AdSense account safe. Black hat is always harmful for blogs, AdSense account. It will ban your blog forever and Google AdSense is nothing, you will get ban your account too. So you must need to avoid this SEO technique for our blog. Don’t share your Google AdSense publisher ID to anyone. It's always danger for your AdSense account. So make sure about this step. Also don’t share your AdSense code to others. If they put your code in illegal site and do fake clicks. You will lose your account soon. You create AdSense ads spot for your blog. Don’t change anything or any codes, just insert their code into your website. If you change your code, your account will not safe. Never break their policy by changing codes. After you got a approve AdSense account. Don’t create illegal site or don’t put your Google AdSense codes in those sites. If you do this, your account will ban within a day or some hour. So make sure you put their AdSense code in legal sites. That’s it. If you follow this steps, hope your Google AdSense account will be safe forever. Thanks a lot for spend you time to reading this post. If you need any kinds of help about Google AdSense, don’t hesitate to ask me on comment below. I will glad if you share your way to keep your AdSense account safe in comment. Thanks again. I also got banned for did a mistake when i got my first Google AdSense account. Thanks for sharing the valuable tips for safe our account. I think most of newbies got banned when they got first adsense account without getting a proper knowledge about this. If you have good knowledge how to make your account safe. Anyone can make their account safe for use it on blogs. Thanks. Thanks for share this very useful adsense guideline. Thanks for the tips. All this time I may missed a thing you said above. Unfortunately my account was banned. I'm really glad to know you like this post. If you success to follow those steps, your account will be safe next time. :) Thanks for your comment. This post is very descriptive.But i can Run adsense ads in any site/blog from hosted account. Note:i tell this for free. is blog commenting and facebook group sharing a spam ?? :o !!!!!!!!!!!!!!!!!!!!!!!!!!!!!! love to read and follow all these steps to my adsence account safe and secured.. Necessary easy & important computer Tutorial for all. Hi friends what can I do after getting approval from AdSense. Hi thanks for sharing some important points. But I have expected the steps to be followed immediately after we get the adsense approval. Like how to get the pin number from adsense and how to activate our payment using that pin. How to receive the pin number and how many days it takes. Please share these points if possible. I got approved but i have a question. what about Sharing your website Url in comments of Websites. i thought is is SEo. Suppose here in this comment i share my website will my adsense got banned. hello sir i got the adsence add code fot the website then what should I do i would like to run add banner on websites. This post will really help me strategizing the internet marketing campaign for my company. do not spam this only formula to save your adsense. Thanks for sharing this amazing article, I also got adsense approved account. Powerful content, keep it up.